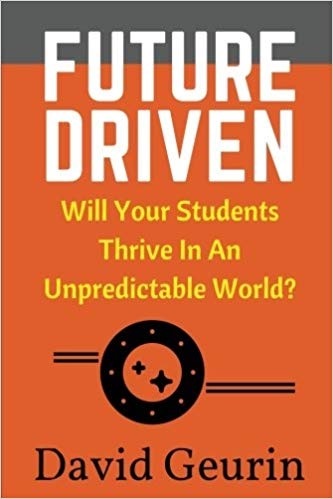 Future Driven: Will Your Students Thrive In An Unpredictable World? by David Geurin encourages teachers to look to the future as they design lessons to excite their students. To make students future ready you need lessons connected with reality, projects, collaboration, and tolerance for risk. Although we can’t predict the future, we need to adopt a futurist vision and be adaptable and mentor adaptable learners. 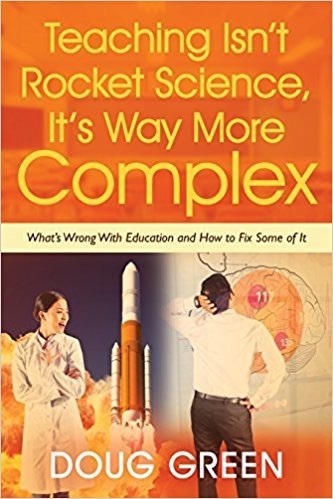 After you read this fine book be sure to get a copy into the hands of any educational leaders you know. Too many classrooms don’t look or function much differently than they did decades ago. Nonetheless, educators need to look forward as they prepare their students for an uncertain future. For most of us, there were parts of our education that were timeless. There were also probably too many that were needlessly passive. The idea that we should help students find and explore their passions is relatively new. One thing that is apparent is that we need to create adaptable learners as adaptable learners will own the future. The key is to develop skills that are transferable to unknown situations rather than reducing a student’s achievement to a few numbers. The need to adapt is not new. People with adaptive ability have been more successful in the past and this skill is more important as change accelerates. Everyone encounters the unexpected in life. Rising to unexpected challenges is essential to success. Students should know this. We can expect, however, millions of jobs to be replaced by automation. We can also expect new jobs related to technology. Knowing this should help educators be more forward-thinking and future driven. It’s also a safe bet that hard work will still have great value in the future as it has in the past. To think like a futurist teachers should 1) Be willing to challenge how they are doing things now 2) Read the news with an eye to the future 3) Reflect on ways to help students be adaptable 4) Share ideas with students and colleagues about what the future may demand 5) Embrace the future even when it’s difficult. 3. What If Schools Were More Like Google or Starbucks? Here David provides the names of successful companies who are very innovative along with companies that have failed for failing to innovate. Unfortunately, many schools are happy with traditional teaching methods where there is a lack of student input and collaboration and a focus on test prep. Such schools will not thrive in the future. Some schools are looking to innovative companies that turn employees loose to innovate and tailor products and services to individual needs. Schools need to personalize instruction, which is easier to do if every student has a laptop. Student voices need to be heard and students need to have some choice in regard to what they study. The students should function like a think tank, which will promoter ownership. Classrooms should be flexible (including standing desks) so that furniture can be rearranged to allow for various sized student collaboration groups. Students should also have a say in classroom decoration and design. Innovative companies want employees with the ability to learn and who know when to lead and stand back. School libraries should feel like Starbucks. Like many other authors in the modern education field, David feels that student relationships are the most important thing that educators should work on. He tells how what he has done as a principal to get to better know more of his students. Strong relationships are the foundation of one’s ability to lead and influence. For this reason, schools must teach and model interpersonal skills. Teachers need to be aware that many of their students will suffer physical and emotional problems outside of school and be prepared to offer empathy. The next big idea is to make sure that you take care of your own physical and emotional needs so you will be fit enough to help others. Ideas for connecting include attending student extracurricular activities and sending positive handwritten notes to students and parents. David even devotes part of a faculty meeting for note writing. David thinks that schools put too much emphasis on student weakness and remediation and not enough focussing on student strengths. The chapter ends with ten things you should say more often like I believe in you, I’m here to help, and I’m listening. This entry was posted on Wednesday, August 1st, 2018 at 7:29 am	and is filed under Education Books, Leadership Books. You can follow any responses to this entry through the RSS 2.0 feed. You can leave a response, or trackback from your own site.